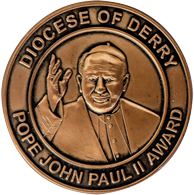 The Pope John Paul II Award was created to commemorate the late Pope John Paul II who was so committed to young people and who had such belief and confidence in them. Who is the Bronze Award for? How do I enrol in the Award? To enrol, complete and sign the application and consent form. You should then return the completed form along with with the enrolment fee to your Award leader in your school/parish. When your enrolment is processed you will receive your Record Card from your Award leader. You will decide with your Award leader what activities you intend to carry out under the sections ‘Parish Involvement’ and ‘Social Awareness’. As you progress through the Award and complete each activity it is important to get each individual activity signed off on the record card by the named facilitator. Please be sure that the named facilitator signs your Record Card each time an activity is completed. Your personal reflection is to be completed at the end of the tasks. Yes, there is an enrolment fee. Please refer to your Award leader. 16 months beginning in September. What exactly do I do to earn an Award? You earn your Award by taking part in activities through Parish Involvement and Social Awareness, and preparation of your personal reflection. On completion of the hours and the personal reflection, you should return your Record Card and presentation to the Award leader. These are ratified by the school principal and forwarded to the Pope John Paul II Award Committee. These type of activities will gain Bronze Award participants Top-Ups of 3 hours. When the participant completes the Parish Involvement and the Social Awareness sections of the Award he/she creates a personal reflection. This reflection may be written (approx 1500 words) or through an interview (interview conducted by the Award leader, recorded, then transcribed). An answer to the question – What does it mean to be a baptised member of the Church? Through the personal reflection, the participant will show a knowledge and understanding of what they did within the context of the Church. Their role within the Church will become more apparent. The guidelines and template for the personal reflection can be downloaded below. Download in pdf format a list of parish and social awareness activities Award participants are doing in some dioceses. This is not a definitive list, but for guidance and ideas for JP2 participants and Award Leaders.